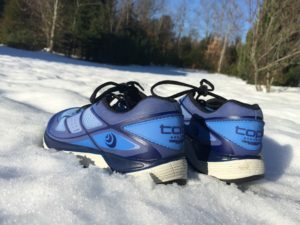 Meet the Topo Athletic Terraventure. Normally, I wait to say I love something until I have run all the miles, but this was more of a love at first run type of experience. And, I will put it out there, I was a bit skeptical — I have worn the same trail shoe since I made my trail running debut 5+ years ago. What can I say, I like what I like. But, sometimes you have to break outside of the comfort zone and try something new. So, I did. And, lucky for me, I might have just found my new favorite shoe – the just released, Topo Athletic Terraventure. aggressive grip and the colors are spot on. “The Terraventure pushes the limits of lightweight performance and rugged durability. This platform features an aggressive lug design providing better traction and mid-foot stability. Fit: I have a narrow foot. Hello skepticism on the wide toe box. But, this shoe is different. The mid-body of the shoe is narrow. Yes, someone finally got it right! 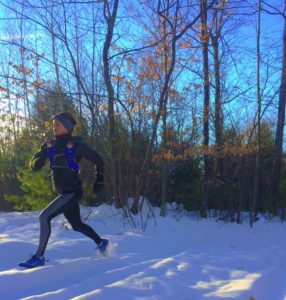 The support, narrow mid-body and wide toe box is exactly what I want when I hit the trails [or, icy roads – cringe – Winter in New England is fun]. 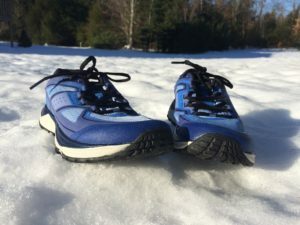 The mid-body gives my foot a warm hug and my toes have all the room to move – and, my precious toes and feet are protected from the elements by the rock plate [like, roots and rocks and those things we always fail to see until our feet connect with them and extra rugged tread]. I wear a 6.5, which is what I normally wear, so I will go ahead and say, the shoes run true to size. Aesthetics: There are no secrets here; I always buy shoes based on appearance too. They have to feel good and look good. Silly, maybe? But, I spend a lot of time in these shoes, they may as well look really good too. The blue combination is beautiful. Check the Terraventure design out. You just might happen to think they are comfortable and eye-catching too. Don’t forget to enter for your chance to win a pair of the Terraventure trail shoe on Instagram.